Mira Banul, a high school senior, lives on an island near Atlantic City with her single mom and her younger brother, who has Hunter Syndrome. She and her best friends Deni and Eva, love their close-knit coastal community, and they are mostly used to weathering major storms. When a superstorm strikes the island unexpectedly, however, no one is prepared. Mira's family is stranded at a medical appointment on the mainland, and she alone must try to save what little she can of their precious belongings as the house is destroyed by wind, water, and mud. In the aftermath, Mira must face the possibility that her friends have not survived, while also maintaining a sense of hope that someday their beautiful island will be rebuilt. Beth Kephart's writing is highly descriptive and lyrical, heavy with imagery, and emotionally moving. While some authors who write this way seem like they are showing off, or trying too hard, this is not the case with Kephart, who has excellent control over the English language, and manages to write a beautifully poetic text that also reads quickly and easily, as survival tales should. I received this book as a prize from Armchair BEA and didn't really plan to read more than a few pages, but once I started it, I could not put it down. I became completely engrossed in the setting, and attached to Mira and the people who matter to her. The plot is really secondary to the language, but even so, there are a couple of surprising turns of events that caught me by surprise and felt very satisfying. 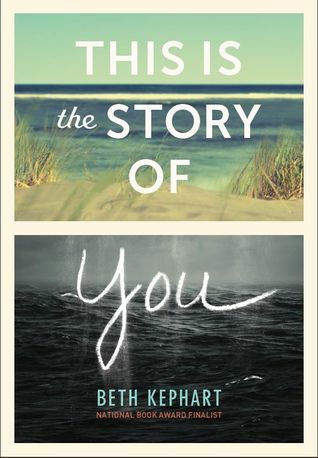 Though This is the Story of You is a realistic novel, it does have a lot in common with dystopian YA books that speculate about how teens might survive after a major disaster. Reading this book reminded me so much of my experience reading Life As We Knew It by Susan Beth Pfeffer, only this story is more troubling in many ways, since it has really happened, whereas Pfeffer's novel only seems like it could. Aside from the books I reviewed this week, I don't read much YA anymore, so I'm not really informed enough to make this statement, but I would be thrilled to see this book with a Printz sticker on its cover this winter. It's been a long time since I've read a novel marketed to teens that was so beautifully done.